Bill and Hillary Clinton will attend President-elect Donald Trump's inauguration ceremony on Jan. 20 in Washington, D.C., after being out of the public eye for weeks. The former first couple decided to show up for the inauguration to respect the democratic process, the New York Magazine reported Tuesday. Two well-placed sources tell New York that over the past few weeks Hillary Clinton discussed with trusted advisers and friends whether or not she should attend the inaugural. She and President Clinton, the sources said, decided to do so out of a sense of duty and respect for the American democratic process. 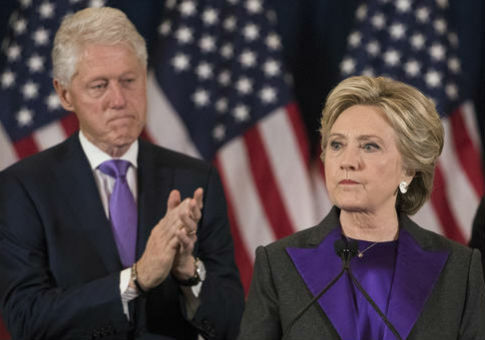 Hillary Clinton, the former first lady and 2016 Democratic presidential nominee, has been visibly absent from public appearances since she lost to Trump in the election in November. While she has delivered a few speeches since the election, she has spent time hiking through the woods and reflecting on her surprise loss. Former President Jimmy Carter will also be attending the inauguration. Carter, who endorsed Clinton last year, announced in December that he would attend the ceremony, according to Politico, which noted that it is tradition for all former presidents to be invited to the event. Following tradition, all former presidents are invited to attend the ceremony on Jan. 20 when Trump will be sworn in. But not all living presidents have consistently attended the inaugurations of their successors. President Barack Obama in 2009 enjoyed the presence of all four living presidents— both Bushes, Carter and Clinton — at his first inauguration, but the Bushes skipped Obama's second event in 2013, citing George H.W. Bush's compromised health. George W. Bush and his wife Laura Bush will also be attending the inauguration ceremony, according to a statement from the former president's press office released on Tuesday. "President and Mrs. George W. Bush will attend the 58th Presidential Inauguration Ceremony on January 20, 2017, at the U.S. Capitol in Washington, D.C.," the press release said. "They are pleased to be able to witness the peaceful transfer of power–a hallmark of American democracy–and swearing-in of President Trump and Vice President Pence." Bush's father and the 41st president of the United States, George H.W. Bush, will not be attending the inauguration because of his health at age 92, according to his spokesman Jim McGrath. This entry was posted in Politics and tagged Bill Clinton, George W. Bush, Hillary Clinton, Inauguration, Jimmy Carter, Trump Administration, White House. Bookmark the permalink.